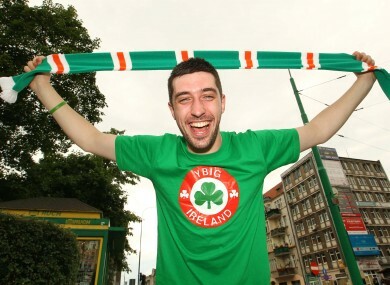 Cian O’Callaghan has joined the green hordes in Poznan and he’s already in festive spirit. A happy camper: Neil Byrne from Portmarnock. AS THE SONG goes goes ‘We’ve been 24 years just waiting for a chance’. A long, long wait to relive the heady innocence of Euro 88 when the stocky man with the Glaswegian brogue looped that header into the English net and ignited a love affair between the public and our national soccer team. The planning, the waiting, the anticipating is finally almost over and the Boys in Green can get on with the business of slaying the slick Croats, the imperious Spaniards and the unpredictable Italians. And, more importantly, the Green army can get on with partying like it was 1988 all over again. We’re not as wet behind the ears as we were then and we know what a momentous 10 days, and possibly more, this is going to be. For the fortunate 30,000 or so – some recession eh? – invading Poland, including yours truly, it’s going to be one hell of a session. And some of the tales being told of the lengths people have gone to get there, of the kind of planes, trains and automobiles that would put John Candy in the shade; converted buses remodelled with 24 bunk beds, Hiaces rented in Romania with three mattresses squashed in the back. For myself and my mates, since the day we whacked four past Estonia to book our place, all sorts of plans, ideas and capers have been discussed, dismissed and fought over as to how we were going to get there. The early favoured method – the campervan – was dismissed after a relatively short period of reflection. With the amount of alcohol going to be consumed along with the expected diet of grease and fat, and general drop in hygiene levels that accompanies living accommodation with wheels, meant the stench out of the van would permit a contented night’s sleep only under conditions of alcohol-induced sedation and a leisurely lie-in, a cornerstone of all enjoyable holidays, would be impossible and undesirable in the circumstances. The option of parking a campervan up on one of the fans’ sites and staying in a tent appealed less; having seen the campsite at Oxegen turn into a nuclear test site after a single day, the squalor after 10 would be unimaginable. So hotels at arm-and-a-leg prices it was for me but really does it matter a jot? When Robbie flashes in an equaliser to grab a vital point in our opener against the Croatians would it matter a jot that I spent the previous night asleep beside a pool of someone else’s vomit? When Richard Dunne yet again clears a Spanish strike off the line why would I care if my bare backside hadn’t seen water in 4 days? And what about when Trap masterminds another smash-and-grab against his countrymen in the inevitable do-or-die final group game, so what if my underwear supplies have long been exhausted? The last minute checks have been done and I’m praying to Jaysus that I get over there today with my tickets and my passport still safely in my pocket. So here’s to the next nine days of mayhem, the 90 pints of beer, the 45 shorts, the 25 bags of chips and 20 1/4 pounders with cheese and the inevitable couple of nights hanging out of the bowl; here’s to the magic moments on the pitch, the memorable times off it, but most of all here’s to the Boys in Green – go on Ireland! Email “On Tour: Fans in Poznan dreaming of that one big day”. Feedback on “On Tour: Fans in Poznan dreaming of that one big day”.